An ideal solar cell converts sunlight very efficiently into electrical power for as low a price as possible. This goal can be reached by making solar cells much thinner than before. Ultrathin layers use less material and thus have lower production costs. In this small-scale geometry, higher electrical voltages are also possible because the charge carriers (which form the electrical current) do not easily recombine and therefore limit the current. Nanowires are interesting candidates for small solar cells because they can satisfy these special characteristics. The researchers from the light management programme, working at FOM institute AMOLF, have taken the first steps towards producing solar cells from nanowires. They did this by adding a very thin layer of copper oxide to metal nanowires. They made the layer by means of wet-chemical reactions that allow a uniform ordered crystalline structure to grow directly on the metal surface of the nanowire. In this special nanowire, with a metal core embedded in an ultrathin semiconductor coating, the core acts as an antenna for the incoming light and therefore concentrates the light in the semiconducting shell. This localised concentration of light can give rise to a high electrical voltage. The metal core also functions as a local electrode to conduct the electrical current generated by the incoming light. If more nanowires are grown on the surface and joined together in an electrical network a structure that looks like a 'solar highway' is created. Such a solar highway could convert light to electricity with very high yield. 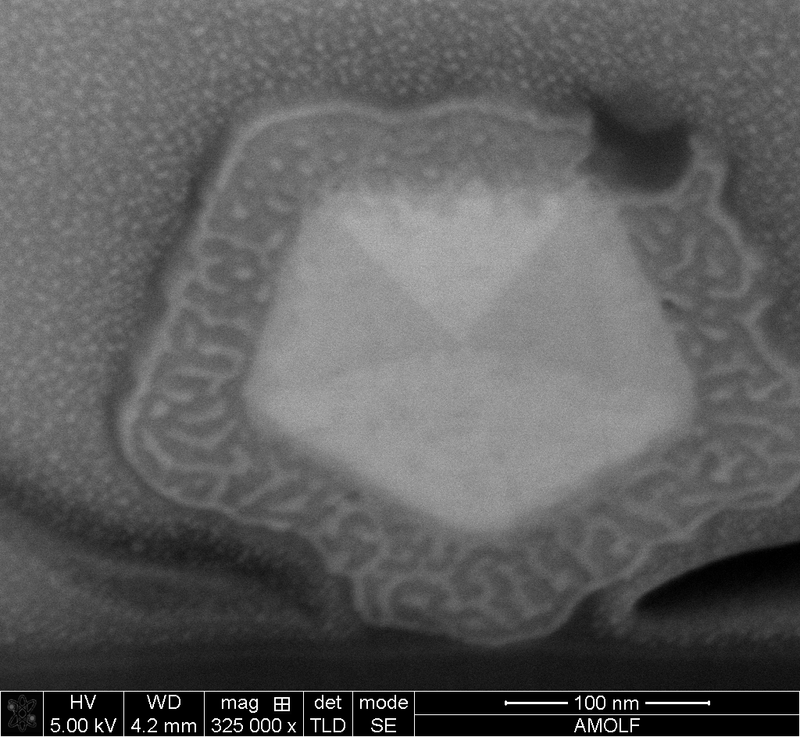 Cross-section of a silver nanowire with a copper oxide (Cu2O) layer, made with a scanning electron microscope. 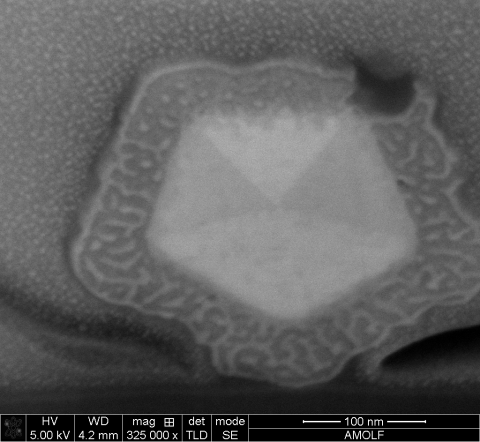 The pentagonal silver core exhibits crystalline boundaries. The copper oxide shell exhibits the same pentagonal form as the core.